I was disappointed with this. 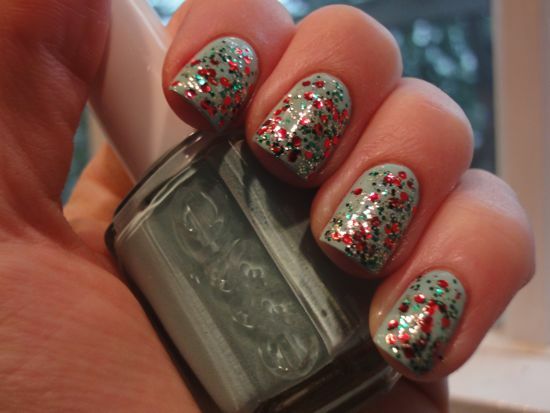 Somehow, the Essie Mint Candy Apple is so blue that it doesn’t harmonize with the Party Hearty glitter. The second picture is more the way it looked in normal wear, without direct lighting. 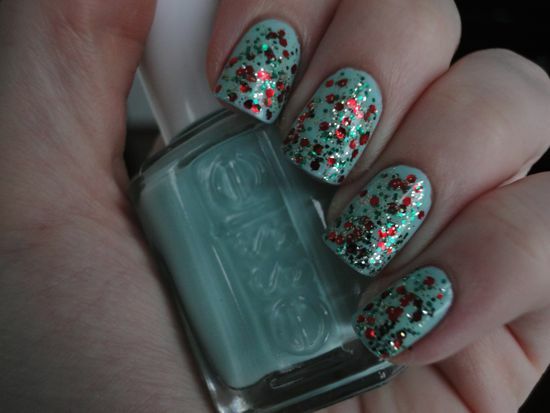 And you can see that the Essie Mint Candy Apple just has this very cold but bright look, not warm like Party Hearty. Whenever I would catch a glimpse of it on my fingers, it gave me a little ugh! feeling, like it was clashing. I like both of these colors by themselves, but I do not recommend combining them.